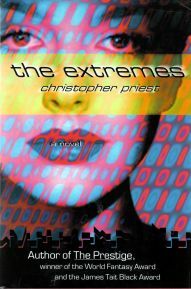 The Extremes (1998) is a novel about the aftermath of gun violence, the terrible effect of a spree killing, with an approach appropriate to the digital age. Christopher Priest happened to be in Hungerford on the day in 1987 when more than thirty innocent people fell victim to a socially maladjusted young man in possession of semi-automatic rifles. Of those who were shot, sixteen people died. This novel eventually grew out of that experience. The central character of the novel is an American woman, Teresa Simons. Teresa is an FBI Special Agent, presently on compassionate leave after the violent death of her husband Andy. Andy was also an FBI agent. Teresa has discovered that the gun massacre in which Andy was killed had an inexplicable twin event in the UK – it occurred on the same day, there were the same number of victims, the same weapon was used, and more. She travels to England to try to investigate what might be behind the coincidence. She comes to Bulverton, a quiet English seaside resort, where the inhabitants are still in shock, several months after the massacre in their streets. She meets relatives, friends and lovers of some of the victims, realizes that their lives have changed just as radically as her own. The mystery of the coincidence remains. Although at first her enquiries seem fruitless, Teresa eventually discovers that on the day of the attack, the gunman was using virtual reality software. Teresa is already familiar with the process, as the FBI used VR methods in their training program. She enters the world of virtual reality, and at last discovers answers.